Being an avid fan of quality reading, our team always search for quality magazines (in addition to other media). The motto is to find the magazine which is not only interesting, but explores something meaningful. Safari– is thus one of our favorite magazines. It is focused on knowledge and explores the scientific facts behind various topics / stories. Though the English edition of the magazine could not survive due to economic issues (based on comparatively less readership), the Gujarati edition runs fine. We got a chance to read June 2016 issue of Safari (Gujarati Edition) on our Magzter app (Magzter is online store for magazines and newspaper; to know more about it, read our review article for the same here). Though we need to frequently zoom in/ zoom out, but we rather than talking about our reading experience, will talk about the content of the issue. 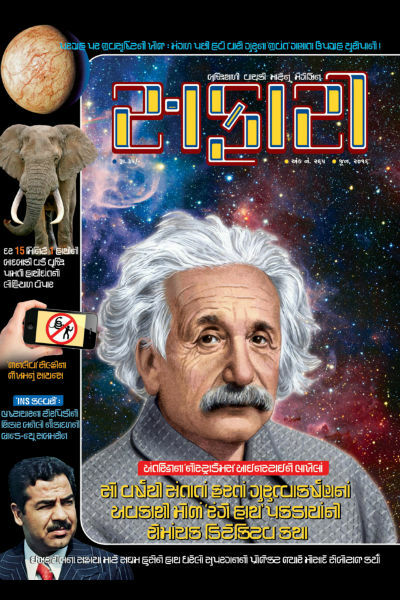 Having space in the background and Albert Einstein in the front end makes the magazine cover impressive. It gives the readers a clear idea about the magazine’s genre. We consider editorial a very important part of any magazine or newspaper. It not only links the editor directly to the reader, but also gives an opportunity to the editor to express his/her point of view about various happenings. In addition it is a platform for the editor to share his vision about the content of the magazine. While, many magazines/newspapers have talked about the Augstawestland scam from their perspective. Sometimes you clearly see the intention to encash the readership with catchy headlines and/or filling pages with repetitive information or taking a side. However in this issue, you can see the editor talking about it to-the-point and in summarized manner. The quest he raise about the morality required when it comes to the security of the nation; is what most of the citizens agree with. It is, a bold piece of the magazine, we consider it as a must read. Especially, the historical reference of such scams happened in past and vendors have not delivered what they were asked for; accepted by the officials; without raising any questions. Magazine editor, Harshal Pushkarna, comes up with a detailed article about INS Kalvari. While INS Kalvari is considered as one of the promising sumarine and a remarkable addition to Indian Naval Forces, the article talks about it’s features in detail. The article fearlessly talks about what is missing in this submarine as well. Usually it is tough to find article which talk about the positives and limitations for any such important resources. Either they focus on positives or the negatives. The article also refers to the reasons behind these limitations, and how corruption affects it. An article, which is not to be missed. There are various proverb focused on elephant, one of them clearly tells that, it is worth even more when dead then alive. Ivory Poaching is definitely one of the most cruel crimes done in order to generate wealth. it is said that there is one African-Asian elephant killed at each 15 minutes by the poachers. On April 30, 2016 the government of Kenya captured a huge stock of ivory which was considered to be collected by killing around 8,000 elephants. In a brave attempt to send a crystal clear message to the poachers, the government have burnt the seized huge stock. However, this important news was not covered by many so-called “News Channels”. This article exposes the double standards of us – humans, who kills animal for his own benefits. The article covers most of the significant details about Poaching and elephant killing. Usually such incidents found their places in Environment/Nature oriented magazines. Safari – did a good job by including it. Project Babylon was considered as one of the most important mission, Late Saddam Hussain have envisioned in order to deal with Israel. The brave Mossad team have sabotaged the plan however and added one more feather of success in it’s history. It is tough to not fall in love or start giving respect the the people who are associated in such spy missions for their motherland; irrespective of your sympathy to the either side (based on your personal choice). If you love reading spy thrillers, you will like an article about a “Supergun” and real incidents associated with it. Though the article revolves around real life incidents, the writing style makes it interesting read and you eventually feel that you are reading a spy thriller novel (or short story). B. M. Purhit wrote an interesting article in this issue of Safari. It is about the possibility of having a ocean on Europa (the moon of Jupiter); and thus the extraterrestrial life there. While there is a lot written about mankind’s quest to explore Mars in finding similar possibilities; a very few articles are written about other plants. This is one such article. Readers interested in exploring the information about other planets and extraterrestrial life will definitely find this article interesting. The images and illustrations in the article makes it more informative and easy to read and analyse the details. While a recent survey based on Happiness Index declared Denmark as the happiest country, what is happiness index, and how the survey was conducted? Also provide information about it’s effectiveness. While USA is being proud of being a democracy (rightfully), did it make any significant attempts in favour of Independence of India (when was under rule of British) from British? How the mountain Girnar came to existence. Is it true that the lioness milk can be kept only in the container of gold? Is there a simple method/work around to learn and remember the basics of Indian classical music? How the Earth looks from the Moon? Why the hull of aircraft career like INS Vikramaditya is specially designed differently? How many atoms are there in our universe? Why the revolution periphery and speed between the Earth and the Sun doesn’t remain static? Explain the method of water harvesting. Name remarkable “Tax Heaven Nations”. How they attract customers? There is also a super quiz section which answers many general knowledge questions. The last cover page brings a detailed answer about the historical incident from recent past when a powerful telescope have finally captured some gravitational force waves. It is better to read rather than to talk about.